Have you ever stood on the beach and watched in amazement at the kite surfers jumping around and thought – could I do that? In a couple of days at KiteFEEL we can teach you to kite surf, and soon you will be jumping and busting out all sorts of tricks with the best of them. At KiteFEEL we have been teaching kite surfers for over ten years and we are renowned for our safety and personal touch. We are are obsessed with kitesurfing and have tried to create a club atmosphere with regular clinics and kite surf vacations to polish up on your skills and to meet up and socialize with other kite surfers. KiteFEEL is a VDWS certified school, which means you will always receive the best training in the safest environment. All of our lessons are held with a maximum of two students to an instructor so you get the personal attention you need. At KiteFEEL we only use the newest FLYSURFER kites and we update / renew our equipment regularly. Our kite surf locations are perfect places to learn, whatever the wind direction, due to their shallow waist deep water. We give lessons at Schellinkhout, Enkhuizen, Edam, Andijk, Medemblik, IJmuiderslag, Haarlem and Wijk aan Zee. 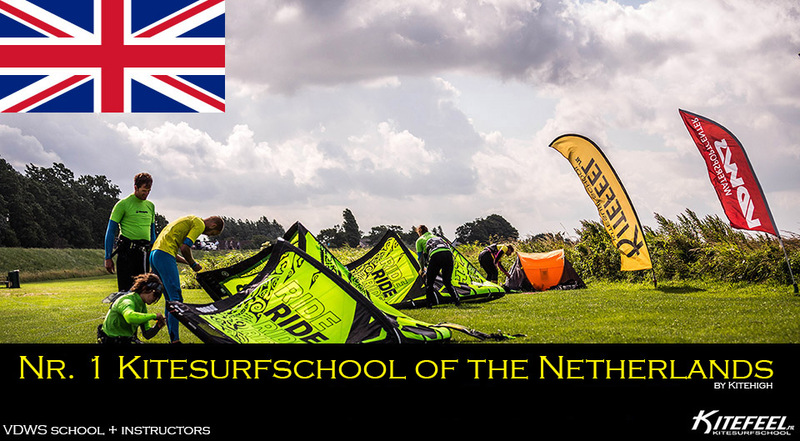 During the last election, KiteFEEL was chosen by the members of Kitehigh as the best kite school in the Netherlands, getting 52.8% of the vote…… which is something of course we are very proud of. You can read student testimonials about KiteFEEL in the review section of the Kitehigh website. Once again KiteFEEL would like to thank all the KiteFEEL’ers out there who voted for us and for your continued support! KiteFEEL has been active in the kite world since 2005 and has watched kitesurfing grow into a large and popular sport. But as the sport grows it important to ensure that safety stays at its heart, which is why we have become a VDWS certified school. All of our instructors are VDWS certified, so we can guarantee to get you up and riding in the shortest time, safely. Click on the link to meet our instructors. KiteFEEL was started by Sven Luijbe who has been obsessed with kites and the water since he was 4. Even before kitesurfing was a recognized sport in the Netherlands, Sven could be found on his surf board blasting along with a (land) foil kite. Sven quickly moved from 2 line stunt kites to larger foil kites, kite buggy’s and land boards. In 1999 kitesurfing arrived in the Netherlands and Sven was immediately hooked, and it is from his passion that KiteFEEL was born and has became the success it is today. Sven: “since my first kite surf lesson when I was 10 I have been on the water pretty much every windy day. As well as kitesurfing for over 17 years I am also a recognized VDWS kite board instructor and teacher. I am a lifeguard, a first aider and a snowboard instructor and on top of this I am licensed to drive rescue boats”. WARNING ….. before you go any further KiteFEEL would like to warn you, you will become obsessed with this fantastic sport ! – fill in the form (in the menu under CONTACT) or call us. – please note – we are reliant on the wind, so the location of the lesson and the lesson itself will be confirmed a day or so before. – we advise you to bring something to eat and drink to keep up your strength. Still have some questions? Call us (+31) 06 37 01 13 64 or send us an E-mail in English to info@kitefeel.nl.